Tamara is looking sharp in the Cha Cha Cha Top in JASMINE/ivory and the Promenade Sailing Pants in FRENCH NAVY. The Cha Cha Cha Top is made from printed poly/spandex with over 4m of satin binding edging the flounced neckline. This sassy top can be worn on or off the shoulders and gives you the best of both worlds, no sleeves and yet upper arm coverage. 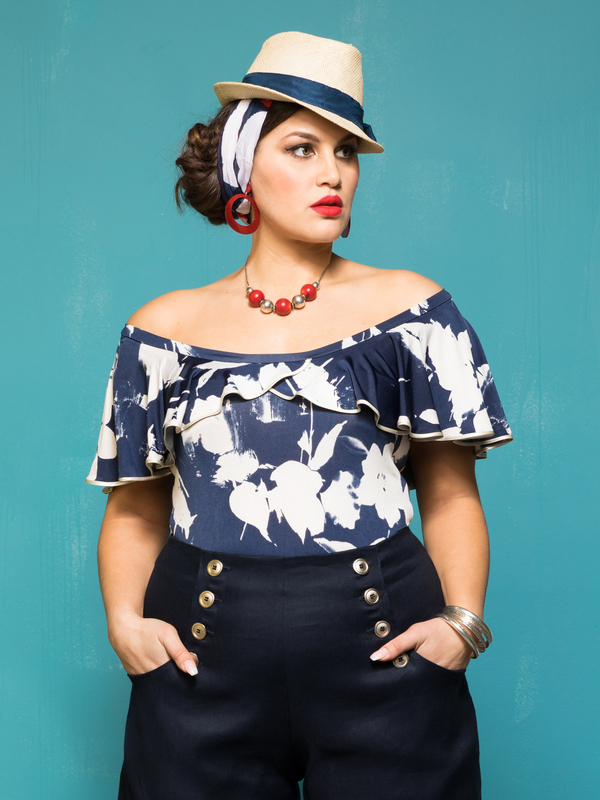 The Promenade Sailing Pants feature metal buttons and front pocket detailing, a wide palazzo style pant leg and the very flattering high waistline. By tucking the top into the pants your eye is drawn toward the nipped in waistline. Tamara is also wearing earrings by Revere Folie and a selection of hammered sterling silver bangles by Mixed Metal Jewellery which are available at Sprinkle Emporium.